Rare-earth-doped gain media such as doped glass fibers have long upper-state lifetimes. This means that we can store significant energy in such a device by pumping it without a signal input, and then extract all the stored energy with a single short pulse. By temporally concentrating the stored energy to a pulse with a duration of e.g. only a few nanoseconds, one can obtain substantial peak powers. Traditionally, intense nanosecond pulses are generated with Q-switched bulk lasers. A totally different approach is to use a cheap low-power pulsed seed source – for example, a gain-switched laser diode – and amplify its output to substantial energies with a fiber amplifier system. An attractive feature of that approach is that one can easily change the pulse repetition rate and output pulse energy without changing the pulse duration, or change the pulse duration and shape without affecting other pulse parameters. Also, one could combine two or more seed lasers with different wavelengths. 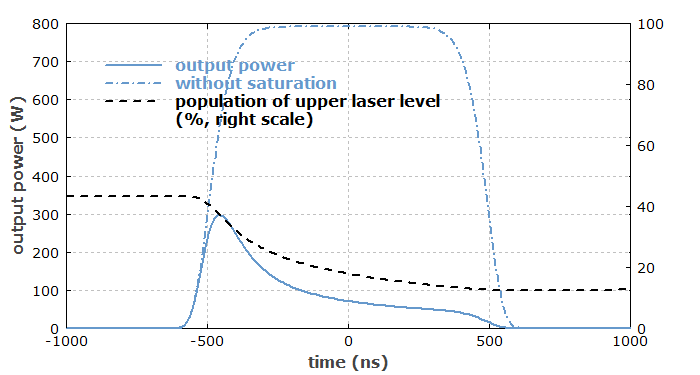 In a Q-switched laser, such flexible parameter control is not possible; for example, a lower pulse energy usually implies longer pulses. The low peak power of a pulsed single-mode diode laser (typically below 1 W) implies that we need a rather high amplifier gain to get to microjoules or even millijoules. With a single amplifier stage, offering e.g. 40 dB gain, we can get some tens of microjoules out. In fact, many applications require substantially higher pulse energies, so that one will then need at least two amplifier stages. A hard limit arises from catastrophic self-focusing at peak powers of a couple of megawatts. The fiber would be destroyed with a single shot if one tries to go beyond that limit. Remarkably, it cannot be increased by increasing the effective mode area of the fiber. Well before self-focusing becomes critical, self-phase modulation (SPM) can lead to severe effects, although not to self-destruction. It can substantially broaden the optical spectrum – which however does not matter for some applications, e.g. in laser material processing. For narrow-band light, stimulated Brillouin scattering (SBS) is a very limiting factor. Even with a relatively large effective mode area of 1000 μm2, the maximum acceptable Brillouin gain of ≈90 dB is already reached e.g. for only 400 W over 1 m of fiber (for sufficiently narrowband pulses). For too high SBS gain, a strong nonlinear reflection sets in, i.e., the power is sent back toward the seed laser and possibly kills it. The SBS power limit can be strongly increased if the seed pulses can be produced with a large optical bandwidth of many gigahertz or even more. Unfortunately, that is not easy to control with a laser diode alone. Note that it is not sufficient just to have a spectrum with several peaks, being separated by many gigahertz; one should avoid any high power spectral density at any wavelength. A superluminescent diode would be better in that respect, but its peak power is even lower. Finally, problems can arise from stimulated Raman scattering (SRS). If the Raman gain exceeds roughly 40 dB, a lot of power will be transferred to longer-wavelength components, typically some tens of nanometers shifted against the signal wavelength. Typically, that problem begins for roughly 100 kW peak power over a few meters of fiber, if the mode area is relatively large. Fibers with larger mode areas help to increase all these limits, except for the self-focusing limit. Unfortunately, there are limits to practically achievable mode areas, as one eventually runs into too weak guidance with an excessive sensitivity to bend losses and fiber imperfections. Note that part 11 of our passive fiber optics tutorial explains fiber nonlinearities in more detail. When amplifying pulses to high energies, we also need to consider gain saturation. For amplifier fibers with small mode areas, the saturation energy of the gain is often of the order of some tens of microjoules. With large mode areas, one can push this to hundreds of microjoules. Nevertheless, the desirable energy of amplified pulses is often even higher, and this results in serious gain saturation effects: the amplifier gain drops substantially during the pulse. As that gain strongly influences the output power, the pulse shape can be strongly distorted. Figure 1 shows an example case, where the output pulse energy is 112 μJ and the gain saturation energy 32 μJ. Figure 1: Output power and ytterbium excitation in an Yb-doped fiber amplifier versus time. The dot-dashed curve shows the output power in a hypothetical case without gain saturation. In reality, the lower distorted pulse is obtained, as the gain drops during amplification. On the other hand, of course we must operate in the regime of strong gain saturation if we want to extract most of the stored energy with a single pulse. For efficient extraction, gain saturation should already be strong at the amplifier input. That situation is often the case for the final amplifier stage of an amplifier system. For that regime, one designs for a relatively low gain, but substantial pulse distortions are nevertheless unavoidable. Note, however, that these are less apparent and less problematic for more smoothly shaped pulses, e.g. with a Gaussian shape, compared with rectangular shapes. As a numerical example for various limitations, we can consider a dual-stage Yb-doped amplifier for super-Gaussian (nearly rectangular) 100-ns pulses with 100 mW peak power at 1060 nm. The seed pulse energy is then 10 nJ. The first amplifier stage has a fiber with small mode area of 80 μm2, so that we get a high gain with a low pump power of 500 mW, as can be obtained from a usual fiber-coupled laser diodes. The seed pulses can be amplified to an energy of 4.5 μJ, which is well below the saturation energy of 52 μJ. Fiber nonlinearities are also not a problem at these power levels. Therefore, pulse distortions are weak, and the power efficiency is low at low pulse repetition rates – which normally doesn't matter much for a low-power preamplifier. By the way, the achievable gain of that preamplifier is limited by ASE, and could be higher for a shorter signal wavelength such as 1030 nm. For the second stage, we use a double-clad fiber (see part 6) with a four times larger mode area, because we know that gain saturation will be strong, and a high gain efficiency is not required for that stage. With 5 W of pump power in backward direction, we obtain a small-signal of 32 dB, also limited by ASE. As the core is slightly multimode, ASE is enhanced. Without any filter between the two stages, forward ASE from stage 1 would act as a seed for ASE in stage 2. That would make ASE in stage 2 very strong, and we could never achieve the 32-dB gain there. For solving this problem, we must filter out most of the ASE between stages, using a bandpass filter with a bandwidth of e.g. 5 nm or less. Also, we use a Faraday isolator which presents any ASE transfer from stage 2 to stage 1 and provides some protection against back-reflected light. 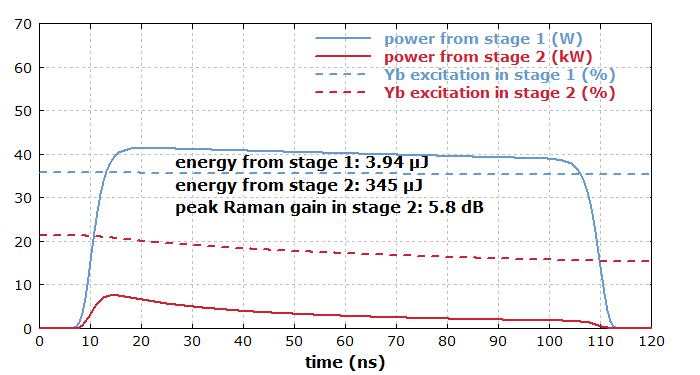 Now we look at the temporal evolution of the output power and the Yb excitation in the two amplifier stages (Figure 2). As one had to expect, gain saturation is strong in the second stage, as the pulse energy gets to 710 μJ, far above the gain saturation energy of 206 μJ. We actually want to be in that regime in order to efficiently extract a high energy. Figure 2: Output power versus time for the two amplifier stages. Gain saturation is weak in stage 1, but strong in stage 2, despite the higher gain saturation energy. 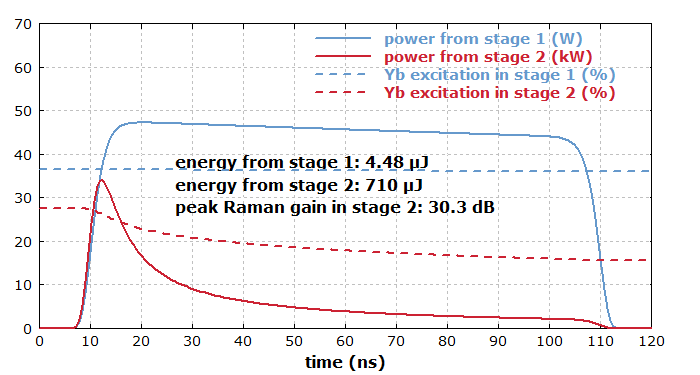 From the time-dependent optical powers, one can calculate the peak Raman gain in stage 2 and finds it to be 30 dB. This is still at an acceptable level, which will not have substantial effects on the efficiency. If we would use forward instead of backward pumping, however, the Raman gain would get much higher, as the pulse energy would rise to high levels earlier in the fiber, if the gain at the input fiber end is higher. The previously presented results were based on the assumption that we pump the two stages for a long time (several times the upper-state lifetime of ≈1 ms) before pulse amplification. (The steady state is already reached after amplifying very few pulses.) Figure 3 shows the time-dependent powers in the steady state for pulse amplification with a repetition rate of 10 kHz. The gain is then saturated to a lower level, particularly in stage 2. The pulse distortion is now weaker, and the Raman gain is much lower. The power loss via ASE (not shown) also becomes very weak. Figure 3: Same as Figure 2, but with repetitive operation at 10 kHz. If we would double the input signal power, that would nearly double the output of the first amplifier stage, as saturation is weak there. Nevertheless, the final output from stage 2 would rise only from 344 μJ to 359 μJ; it was anyway saturated quite strongly. However, there exist other cases where a first stage is strongly saturated, so that a stronger signal input does not help even if the second stage is not yet saturated. If the pulse shape of the seed source can be controlled with suitable diode driver electronics, one can optimize the input pulse shape such that a desired output pulse shape is achieved. For example, one may want to obtain rectangular pulses, i.e., with approximately constant power over some time. Such features are also special to such amplifier systems; they would not be possible with Q-switched lasers. For high-energy bulk amplifiers, one often uses pulsed pumping. Here, the pump energy is delivered shortly before the pulse to be amplified is injected. In that way, one minimizes energy losses through spontaneous emission and ASE, and also thermal effects such as thermal lensing. For fiber amplifiers, one rarely uses pulsed pumping. This is essentially because the pulse energy is limited by other factors, such as nonlinear effects, which cannot be mitigated by pulsed pumping. One uses fiber amplifiers mostly for higher pulse repetition rates, often well above the inverse upper-state lifetime, where pulsed pumping actually does not present any significant advantages. We have seen that pulsed fiber amplifier systems can be an interesting alternative to Q-switched bulk lasers, as they allow for various interesting features. However, it is also clear that the development of such a system is substantially more complicated. One has to deal with a lot of possible issues, such as gain saturation, ASE and fiber nonlinearities. Trying such a development without thorough investigations based on numerical simulations would be likely to fail or at least to be highly inefficient and not lead to optimum performance. Go to Part 8: Fiber Amplifiers for Ultrashort Pulses or back to the start page.